Candidates who have a desire to join public banking sectors need to follow a stern schedule that supports you to attain a goal. 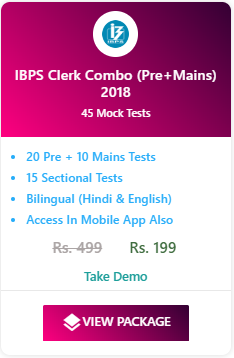 Cracking the IBPS Clerk Exam will be a great dream to most of the aspirants. 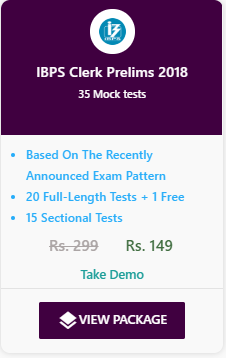 IBPS Clerk Prelims 2018 is scheduled to be take place on 08, 09 and 15th December. In prelims exam, Quantitative Aptitude Section will take more time for solving each question than compared to other sections. To get better marks in the prelims exam, students should have fast solving speed with high accuracy. Total number of questions asked in Quantitative Aptitude section in IBPS Clerk Prelims 2018 will be 35. You have to know which topics need to be attended it first and which are to be at last in exam and it can be recognized by means of incessant preparation. In this article, we will provide you with how to prepare for IBPS Clerk Prelims Quantitative Aptitude section. Make use of our constructive tips and tricks that helps you lot during your exam preparation. Quantitative Aptitude is a section that can panic you a lot but do not ignore that it can prove to be very scoring as well. Sectional timing is introduced this year and so you have to give equal importance to each section. First, you have to understand the topics to be asked and its weightage of marks in each topic. Approximation/Simplification/Inequalities/Quadratic Equations are very scoring and less time-consuming. Start to prepare for these questions early in the preparation. Understand the concepts and do mental calculations to save your solving time. Learn squares, cubes, square roots, cube roots and after that practice a combine of problems based on that. It is also good to learn some short tricks and techniques for faster calculations. Do one set of DI questions including types of Tabular, line, missing, bar, pie and caselet regularly. Many aspirants will skip the preparation of application sums during preparation. But, it is not a right strategy and so you should focus on some easy scoring topics during your preparation. Concentrate on basic topics average, percentage, profit and loss. First, you have to clear on the basic concepts, formula and shortcuts and then commence to practice on it. Solve quizzes daily on each aptitude topic and analyze your performance. Try diverse order of attempt patterns in your mock tests to find out the right one for you. It is important that you should attempt the mock tests or quizzes without any disturbance or break as like the real exam. Make use of the above useful tips and tricks for the preparation of Quantitative Aptitude that helps you to crack the IBPS Clerk Prelims 2018 Exam effectively.